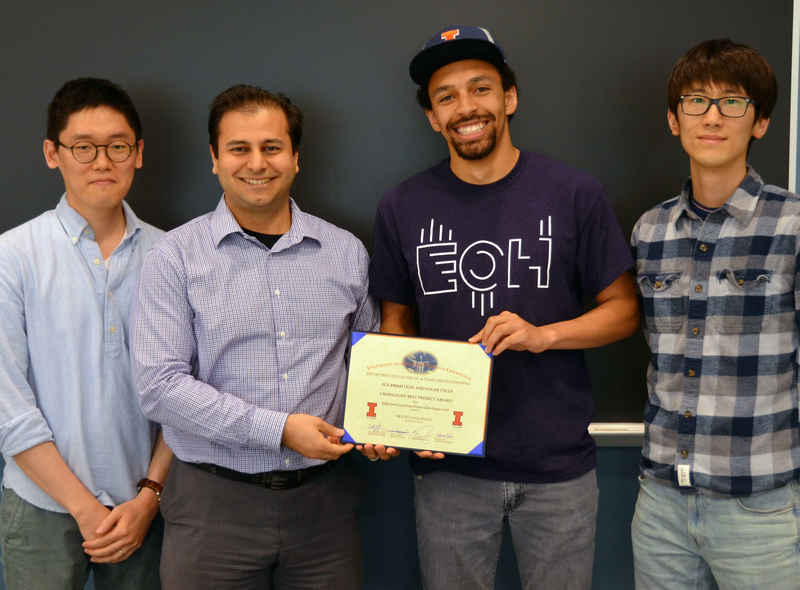 On May 2, 2018, ECE ILLINOIS Assistant Professor Can Bayram presented three Best Project Awards on behalf of Crosslight Software, Inc. The three winners, graduate student Kaitlyn Ann Parsons and undergraduates Bryce Davis Smith and Haonan Wu, will split a $2,000 prize. 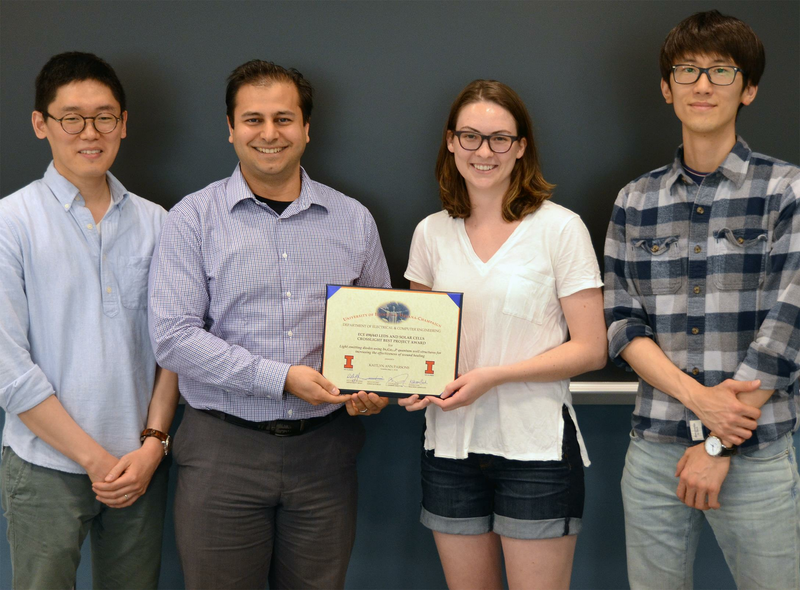 The awards honored exemplary work in ECE 498CB: LEDs and Solar Cells, a special topics course led by Bayram which explores the energy conversion devices from fundamentals to system-level issues. Topics include energy transfer between photons and electron-hole pairs, light emission and capture, emission and absorption engineering via device simulation/design, radiative and non-radiative processes in devices, electrical and optical characteristics, carrier diffusion and mobility, light extraction and trapping, and thermal management for high power high efficiency energy conversion devices. The course is approved into the ECE curriculum as ECE 443 and is offered every spring. Crosslight Software provided simulation CAD software for modeling semiconductor devices and processes for the class. According to Prof. Bayram, who is also affiliated with the Micro + Nanotechnology Lab at Illinois, “with modern semiconductor devices, it is critical to have realistic simulations. Crosslight’s support of the class gave students access to user-friendly, yet industrial, Crosslight Technology Computer-Aided Design (TCAD) software, helping them couple ECE NANOFAB experiments with optical-electrical-structural-thermal simulations." 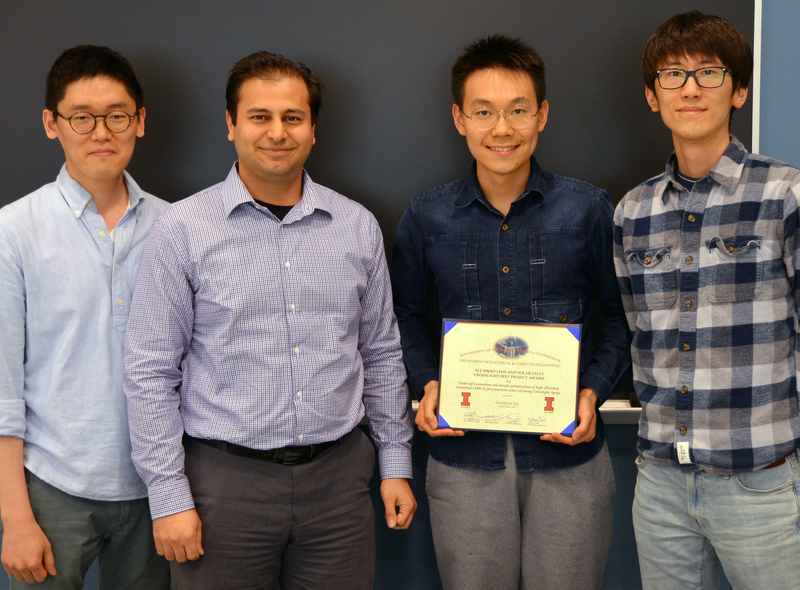 Pictured left to right are TA Kihoon Park, Prof. Bayram, EE senior Bryce Davis Smith, and TA Hsuan-Ping Lee. Pictured left to right are TA Kihoon Park, Prof. Bayram, EE senior Haonan Wu, and TA Hsuan-Ping Lee. Pictured left to right are TA Kihoon Park, Prof. Bayram, ECE ILLINOIS graduate student Kaitlyn Ann Parsons, and TA Hsuan-Ping Lee.